Cotai Water Jet - View timetables, Compare and book ferry tickets at directferries.ie. 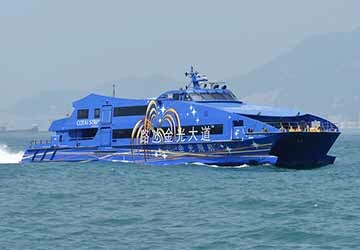 Cotai Water Jet offer a premium high-speed passenger ferry service connecting Hong Kong and Macao. Cotai Water Jet provide direct sailings between ports in Macao, Taipa, Hong Kong, Kowloon, and Skypier at Hong Kong International Airport servicing both locals and international visitors to Macao and Hong Kong. 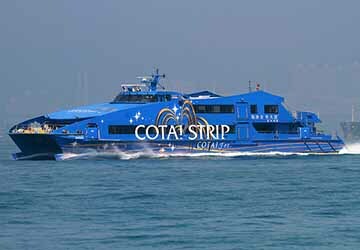 With an average of more than eighty crossings per day, the Cotai Water Jet fleet of fourteen custom made catamarans can carry around four hundred passengers and are capable of reaching speeds of up to forty two knots. On board you’ll find a choice of three cabin classes, ideally priced to suit all tastes and budgets. The standard Cotai class cabin allows you to relax and enjoy the journey in a comfortable environment. A range of snacks and beverages can be purchased on board too. Cotai first cabin is located on the upper level of the vessel and offers a great view of the scenery in a table seating arrangement creating a lounge atmosphere, suitable for business or leisure passengers. Complimentary snacks, beverages and priority disembarkation from the ferry are included in the ticket price. Cotai VIP cabin is a private room for those who require increased privacy, luxury and an unrivalled on board service. The VIP cabin houses up to eight passengers and features complimentary food and beverages. Use directferries.ie to find Cotai Water Jet timetables, prices and to book Cotai Water Jet ferry tickets. Looking for the lowest fares for your destination? Don’t worry, we’ll also compare Cotai Water Jet with alternative ferry companies.